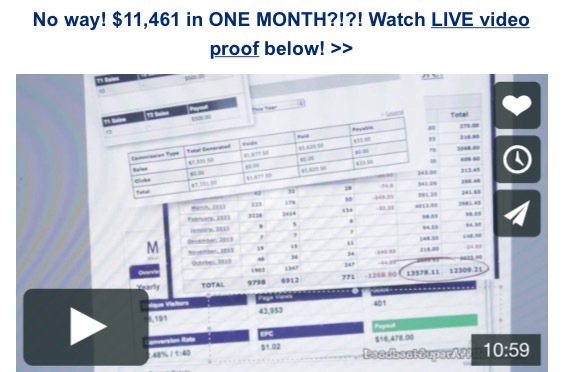 In the sales video for Deadbeat Super Affiliate they claim you can “sleep walk” into your first $3,000 month, and then start making over $11,000 each month after that. If this doesn’t scream SCAM then I don’t know what does. There is no way you will make that amount of money with no effort, it’s just impossible. In this review I am going to explain what exactly Deadbeat Super Affiliate is, and whether or not you should invest in them. Build A Business Online For FREE! What Is Deadbeat Super Affiliate? 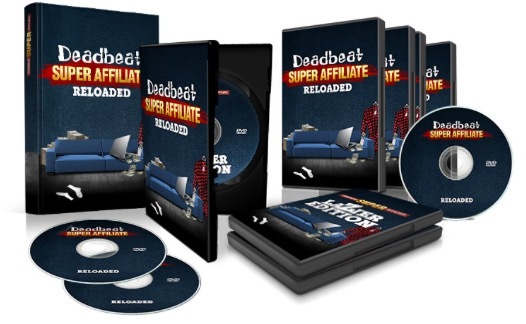 Deadbeat Super Affiliate was originally launched in 2010, and the “reloaded” version was launched in May 2015. It is basically a video internet marketing training program led by Dan Brock. They teach you how to generate an income by promoting different products through affiliate marketing. Apparently you learn how to set up a few websites, post content on the sites, rank high in the search engines, and get affiliate commissions from Amazon. It is for beginners, as well as marketing professionals. How Does Deadbeat Super Affiliate Work? Deadbeat Super Affiliate begins with a sales video that shows Dan bragging about how much money he has, how many nice things he has, and how little work he does (a common scam tactic). The “proof” he shows does not show verification’s or anything like that, so it is hard to tell if they are real. None of this is going to happen without A TON of work and education. You have to find the products, create your own content so it is unique, do keyword research to rank high in the search engines, find people that would be interested in the products, etc. They make it seem like there is no work involved, when in reality there is a lot of work. Don’t get me wrong it is COMPLETELY possible to be successful by creating a website, but it will not happen overnight. How Much Does Deadbeat Super Affiliate Cost? You can have access to all of the training (listed below) for one payment of $17. However, there are 2 upsells that they want you to join after you sign up for Deadbeat Super Affiliate. One if for $47 and the other is for $97. I hate upsells, unless they are EXTREMELY needed to further your success. However, if they are absolutely needed then they should be added in the sale price, so the upsell doesn’t make it look like a scam that just wants your money. Video #1: Register for an Affiliate Network – This can be Amazon, Walmart, or any website that has an affiliate program. Just make sure the products you sell are related to your niche. Video #2: Choosing a Market – This is where you decide what you are passionate about and what you want to start selling on the internet. Video #3: More Niche Research – You have to choose a specific niche. For example; if I wanted to baby clothes, I could narrow it down and sell baby shoes or hats. The more specific you are, the better. Video #4: The 60 Second Competition Check – This is where you search for keywords that have low competition. The less competition your keyword has, the more people will find it when they search for it. Video #5: Register your Hosting and Domain – Every website needs hosting (it costs money usually a few bucks a month), and it is a shame that Deadbeat Super Affiliate does not include it with your site. You also need to choose a domain for your site (costs another $10 or more a month). Video #6a: Installing WordPress for “Deadbeats” – The use WordPress and so do I, so it is a good place to manage you site. Video #6b: Addon Domain Setup – This shows you how to addon your domain. Video #7: Basic WordPress Optimization – This shows you how to optimize your site. Video #8: Installing “The Deadbeat Theme” – This is just a certain theme that they want your site to be. Video #9: Adding an Article – This is just showing you how to post articles on your site that are content rich with good keywords. Video #10: Inserting Affiliate Links – Here they show you how to add links to your site so people can click on it and buy the products. Video #13: About Me – This video just shows you how to create an About Me page, so the reader can know more about you and your site. Video #14: Adding More Articles – The more articles you have, the more traffic you will get. Video #15: Advanced Link Building – Just more information on links. Video #16: Introduction to Video – Here they show you how to create videos and upload them to YouTube, which is a great way to get traffic. Video #17a: Creating a Video with VideoMakerFX – This is a place where you can create videos right on your computer. You can show the screen or yourself. I personally recommend Screencast-o-matic instead. Video #18: Uploading you First Video – Here they challenge you to upload your first video. Video #19: YouTube Channel Optimization – Here they show you how to use keywords and content in your video post to get traffic. Video #20: Buying YouTube Views – This is where you will have to spend money on fake views and likes (not a good idea). Video #21: Distributing you Video to Other Networks – Here they show you how to share your video on Google Plus, Facebook, Twitter, etc. You also get a Fast Action Bonus (LIVE web event) for signing up. unsatisfied before the 30 days is up then your money will be refunded. However, their Terms of Service states that you can let them know within 60 days and you will still be refunded. You can contact Deadbeat Super Affiliate through email (MakeMoneyOnlineDeadbeat@gmail.com), and once you log in you can use their live chat. They are good with helping people, and Dan is there to help you as well. I personally think Deadbeat Super Affiliate is a good program with good affiliate marketing training. They may have some scam tactics and complaints, but you can learn a lot from them for a low cost. There are definitely worse programs out there, but there are better ones too. You are never going to create an income online by doing nothing. It is going to take hard work and dedication to generate an income online, and the sooner you realize that the sooner you can start your journey to success. If you have any questions or have had experience with Deadbeat Super Affiliate, please leave a comment below! ← BinaBot – Is This A Binary Options Program That Works? I was seriously considering purchasing this program because I have no idea how to maximize my blog and was willing to shell out the 17 bucks! Thank you so much Karissa for this post. I’m amazed at how you dissected and simplified everything and I guess I have to learn on my own how to affiliate market my self through amazon! I’m glad I was able to help. You are correct, the best way to make money online is through affiliate marketing. The best place to learn everything you need to know and have all the help you need is at my #1 recommended program. You can join for FREE with no obligation. They are the reason this website is possible. If you want to try it out you can sign up here and I will be there to help! Let me know if you need anything and I will do my best to help! Hello and thanks for sharing, it is so amazing of all the different types of training programs that are out there and that is saying that the have the answers to what to what out are looking for. Before you take the jump it is always good to do your home work first. This is the first time that i have heard of a system such as this, it sounds good you can learn a lot from what they have to say. i guess it may be worth a try as long as you are sure this is what you want. making money online and from the comfort of your home home is awesome and the benefits are great. Hi there! I just finished reading your excellent review of Deadbeat Super Affiliate and just had to drop you a few lines to share my thoughts. To be honest I thought this was going to be a total scam! I don’t know why so many of these training systems have to follow the exact same template that implies that its so easy to make money on the internet. Make money whilst you sleep, the visitors just turn up and buy, the products sell themselves! Come on guys, we’ve heard it all before! What is really crazy about this training is the fact that you have shown us that its not all that bad really! Going on the sales video I would have said this was a complete scam, but then it turns out its not. I’m sure these guys would sell more copies of their program if they just used a bit more honesty! 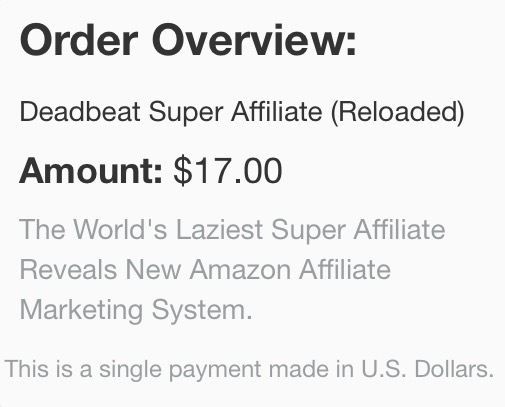 Deadbeat Super Affiliate…in my opinion even the name sounds scammy. Based on your writeup though I guess there are upsides and downsides especially the cost. I didn’t see much about the community presence behind it since that’s a big part of really getting into content marketing–knowing that you’re part of a group heading to the same goal. In that respect, I’d definitely take WA over this any day. Thanks for the article–it really was informative and gave me some further assurance in terms of what path I should be taking. Thanks for the comment Joshua! Wow you really listed a lot of information here on the deadbeat super affiliate program. I kept wondering away from these details and kept going to your number one recommendation of wealthy affiliate. Although you say it is a legit program, and it probably is after reading through everything here, I just wanted to know it you actually worked the program and what your results were? Also how are your results with the wealthy affiliate program. I like the comparison chart between the two. I joined Deadbeat Super Affiliate just to check it out, but I didn’t stay long.